✅ Trip Verified | We were a large group of young guides and leaders. We had to divert to the airport from Finland. Bags were rechecked and I was taking a young diabetic girl through security with her insulin and pump. She was told not to put monitors through scanners and they could be hand scanned. Every thing else had been scanned. Not good enough for their security (inspite of other airports) doctors notes and medical notes. The woman swore at the girl and told her that next time get a note that does the job. No manners, no respect and rude on all counts to a child who has a disability. Luckily leaders were there to witness this and complain. Is there a job criteria that mentions you can do this? 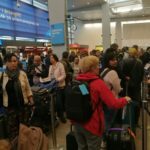 Not Verified | As a Swede I feel somewhat ashamed of the airport, the largest by far in Sweden. Commute to the airport is expensive when it comes to trains, e.g. compared to neighbouring Norway. Shopping experience is so-so, coffee shops and restaurants are highly priced with mediocre service given the price tag, offering is wide and varied though. Worst is dirty and malfunctioning toilets while overall cleanliness at the airport is OK. Very annoying is waiting time for luggage from long haul flights, much worse than large airports such as London Heathrow, Shanghai or Tokyo. Then, and very depressing are the aggressive non-Swedish/English speaking taxi drivers that try to hook up passengers and charging “free” and outrageous bills for driving tourists to Stockholm. ✅ Trip Verified | The worst security staff I’ve encountered at any airport ever. Totally rude, told me to repack my things and I was happy to comply but she told me I was a stupid girl and must hurry up. Left me in tears at 5am, as a young woman travelling alone it was upsetting. Confusing airport layout also. ✅ Trip Verified | What a horrible airport. Poor restaurant selection. Not the greatest signs. Not even unlimited wifi. What century are you living in? Recommendation: avoid at all cost! Not Verified | I arrived there and it was clean and not too busy. There are quiet a few shopping facilities and restaurants which are very expensive but that’s typical for Scandinavia. The terminal signs are confusing and the staff is generally unfriendly when you ask them for help. There are enough seats at the terminals which are comfortable. The WiFi works well. Another problem is the location of the airport. Although it is well connected by train, Arlanda airport is actually far away from the city of Stockholm (41.7 km to the city center, 17 minutes by train). In the end it is not a bad airport but if you want to visit Stockholm, I’d rather recommend you to fly to the Stockholm-Bromma airport if possible because it’s much closer to the city center. ✅ Trip Verified | There’s only one word for it - diabolical! We arrived in the Arlanda lounge at 1.30 only to find, on offer, some dried up lasagna that had gone cold or some cheese. I thought my experience at Bristol was bad enough but this was far worse. I’m just hoping that my next stop, Doha, is a lot more pleasant. It was last time I traveled there. The staff were miserable and unhelpful. How can this be passed off as service? It took a long time to find it too. Not Verified | It was ok for my arrival. Good transport system to the city and a helpdesk to get tickets. But for departure a total mess. Changes gates at the last minute and barely pronounce it. Good toilets. Lazy staff the passport check around half an hour for less than 10 people. ✅ Trip Verified | I was told in a very unfriendly way that I made a mistake when using my phone for boarding. As I was travelling with my daughter who also had her boarding pass downloaded to my phone I passed her the phone back after I already had gone through the gate. As I caused an alarm I was told in a very unfriendly and loud way that I had made a mistake. The lady who talked to me behaved in an unacceptable way. "found security to be efficient"
✅ Trip Verified | Transited through Arlanda airport this week. Since I had a long layover I opted to take the Arlanda Express to Stockholm. Finding luggage lockers for my carry-on items was easy and well marked. The locker cost was a bit expensive though. Finding the train and purchasing a ticket was also easy. Upon my return I found security to be efficient and a breeze to get through though it was not rush hour. Duty Free was the most expensive I’ve ever encountered. There were few if any items that were priced less than I pay at home. What’s the point of having tax free if everything is marked up beyond normal? Beyond Duty Free, my only other complaint was the bathrooms. There were long lines at every single one. How does one screw up bathrooms in an airport? 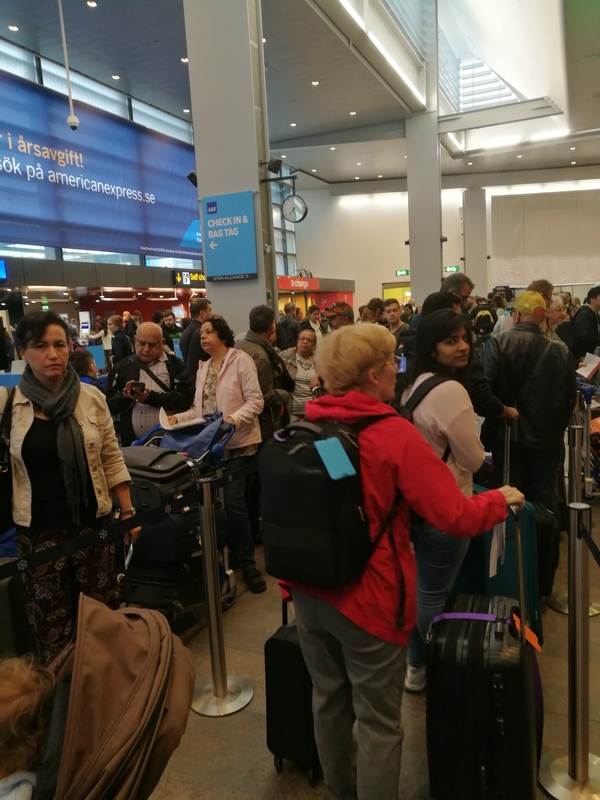 "check in is quite chaotic"
Not Verified | Arlanda airport is around a half an hour drive away from Swedens capital Stockholm and is the biggest airport in Sweden. Arlanda has 5 terminals: 1, 2, 3, 4 and 5. In this review I will only cover terminal 5, the International one. The check in is quite chaotic same for the Security I will say it took around 30 minutes to get past everything. Right after security there is the Tax free or duty free or whatever. Now its a little bit overpriced but still resonable prices. After the tax free there is a huge window with a view over the ramp. There is also a lot of shops and resturants. Then if you continue forward you get to the gates where there is also a play are of kids or something. That are is quite nice where there are some windows over the ramp to see some planes. Note that there is 1 hour free WIFI at Arlanda.